Happy August everyone! How has your summer been? We have been super busy checking off our 2014 Summer Bucket List (post coming soon!) and having a blast! Now life has been settling down a bit, and summer vacation is coming to an end for us, I have been on such a “homemaker” kick recently. I’m not sure why. Maybe because it has been so hot out, and we’ve been staying inside trying to beat the heat. I don’t know about you, but I feel so accomplished when I am able to make something “homemade”. For me, it sort of feels like a special gift that I get to bless my family with! A few weeks ago I successfully made a delicious loaf of Honey Oat Bread, which my sweet hubby devoured. Before my homemade bread dissipated before my very eyes, I had been craving a rich & creamy butter to spread on a slice, with an accompaniment of strawberry jam. YUM! Thinking about that bread, and craving butter to spread all over it reminded me of a “Colonial Day” day I had participated in when I was in Elementary School, making my own butter in a little jar. (We also dipped our own candles, and the girls got to wear special bonnets all day long.) It was such a sweet and fun memory! With that in mind, I searched all over for an easy recipe to make my own butter, and I came across a few recipes that utilized the blender. (Wait, you can make butter in the blender?! Really! No Way!!!!) All of the sites said pretty much the same simple things, so I decided to throw caution to the wind and try out making my own butter. If it was a disaster, so be it. At least I had fun! It ended up being a monumental success (in my humble opinion!). It is just SO tasty, and SO easy, I just HAD to share! So, this is how I did it! Measure out 1 Cup of Heavy Whipping Cream and pour into blender. Add 1/4 tsp salt (if desired). Put lid on blender, and blend on med-high (mine took about about 10 minutes) until butter begins to separate from the butter milk. (I had to stop my blender a few times and push the soft “whipped cream” down with a spoon. It did eventually separate, it just took a little longer.) Be patient, it WILL happen. Once the butter finally separates from the butter milk (it looks a bit curdled), let it sit for a few minutes to allow the butter to rise to the top. Pour out your “Buttermilk” into a separate bowl or jar and save for another baking project (I made these Buttermilk Cupcakes– absolutely delicious!). Finally, take a spoon and scoop your butter from the blender into a strainer to drain the excess “rinse water” out of your butter. Ta Da! 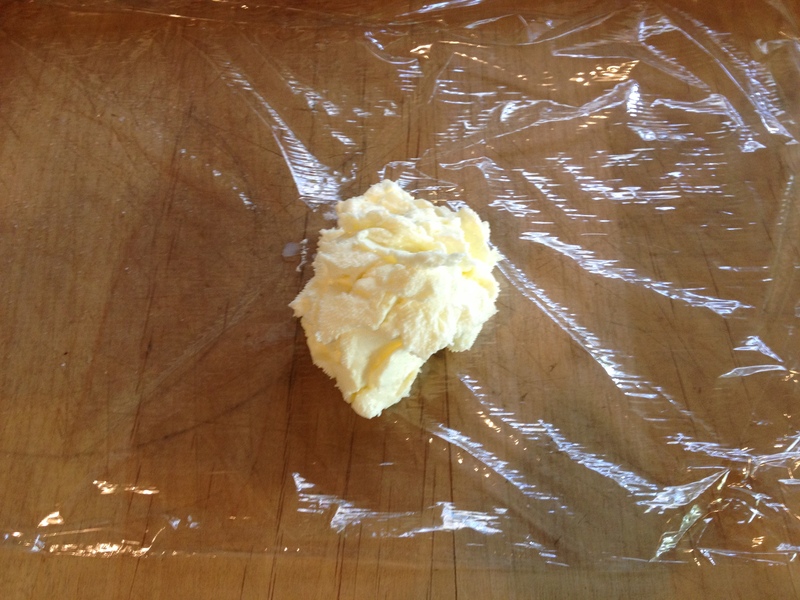 Your butter is now ready for you to enjoy, or scoop into a butter container or make into a “log” and refrigerate! 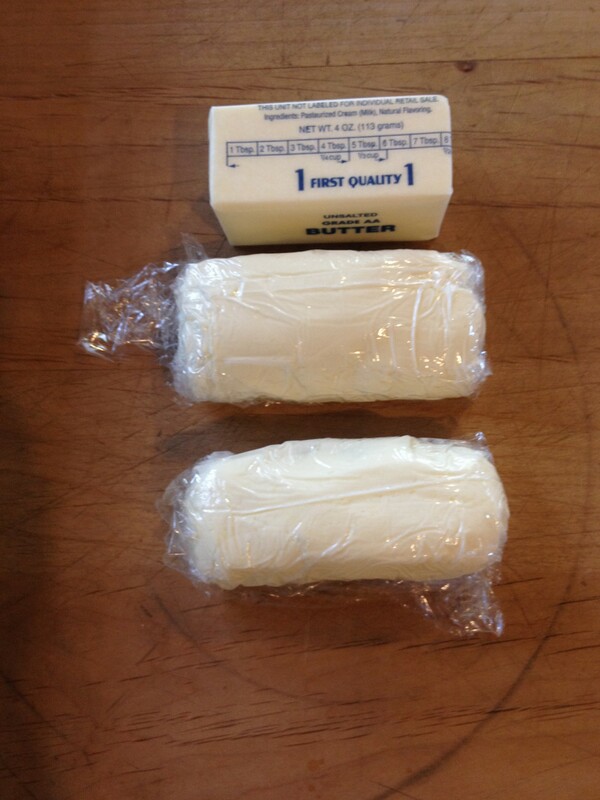 I ended up making 2 “logs” of butter from the one pint of heavy whipping cream I purchased. I added the store bought stick of butter in to the picture because I wanted to show that they are essentially the same amount of butter (my sticks are just a bit flatter and longer). I hope that you have a chance to try this incredibly easy “recipe”! I promise you won’t be sorry you did! If you do make it, let me know how yours turned out! I’m thinking some infused/flavored butters are on dock for the very near future! Have you ever heard the old adage that if you feel hungry even after you have eaten, then you should drink a glass of water to help feel less hungry? A long time ago, I heard that this, and I completely agree! I admit it, I do not drink enough water during the day. I don’t know anyone who actually does drink their “8 by 8” (eight glasses of 8-ounces of water) every day. We all know that drinking water is healthy for you, yet we are constantly bombarded by advertisements portraying beautiful people guzzling down frosty cans of soda, “brisk” and refreshing iced teas, and even chilled bottles of water “flavored” with “real” lemons, raspberries and peaches, and I bet the majority of us will choose the latter. Lets face it, when it comes to a boring ole glass of plain water, the alternatives I just mentioned look pretty appeasing. Unfortunately, all of these are loaded with sugars or sweeteners that are not the healthiest for our bodies. After you drink down all of your infused water, add a bit more ice and pour water over it again to enjoy another glass. Ingredients should last for at least 3 refills! Do you have any amazing infused water recipe that you love? Please share in the comments section below! I am always looking for something new to try! Disclaimer: I am not a certified nutritionist or weight loss specialist. I just really like this water! I adapted my drink recipe from this website. I hope that you will try out my “recipe”, enjoy it, and share it with all of your friends and family!